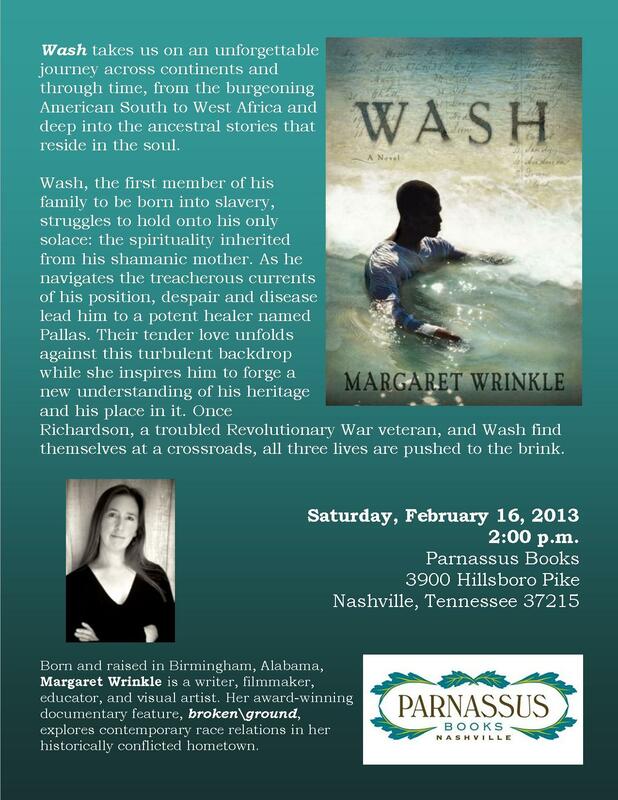 Make no mistake, “Wash” is a big, ambitious, demanding, novel, long but never plodding. Margaret Wrinkle, a Birmingham native, has done a prodigious amount of research and then put it in the service of a vivid imagination and a lyrical prose style. “Wash” is a most impressive debut performance. The novel is set mainly on the Richardson plantation “two days’ ride northeast of Nashville” in the year 1823, with long flashbacks. General Richardson himself is a veteran of the Revolutionary War who received large land grants for his service, and also of the War of 1812. In both wars he was captured and held by the British, in the first on a prison ship in New York harbor, in the second in a stone cell in Canada, near Detroit. He knows what it feels like to lose his liberty, to be a captive, subject to the whims and cruelties of others. Richardson is also, however, a slave-owner, but a most conflicted, ambivalent slave-owner. On his place he treats slaves as well as decency combined with common sense will allow, especially since fears run high after the recent small rebellion led by Denmark Vesey in Charleston. Slave revolts such as Vesey’s and Nat Turner’s sent chills of fear through the plantations of the South. He is also mindful of the eyes and opinions of neighbors, who are more rigid, cruel, and obtuse, and mostly too blind or too thick to realize the full humanity of the humans they own. For example, they speak openly in front of slaves. A one-man frontier nation-builder, Richardson has gained control of huge tracts of land, in the early days fought Indians and even lost his brother in a raid. He has recently bought the Chickasaw Bluffs at Memphis and sent his oldest son there to sell lots and run a store. Richardson working to make it a town. A patriarch, Richardson has a wife and ten children, six of them girls. He is also a brilliant breeder of horses, choosing every mare and stud combination with great care, with a most discerning eye, even an obsession, for what he calls “the fine”—beauty, strength, stamina. At the historical moment of this novel the value of crops, including cotton, is declining, but as settlers open the west, going into territory where there are no slaves except the ones planters bring with them, the most lucrative, maybe the only lucrative, market is in human slaves. Richardson owns a slave named Wash, 26 years old, a tall, strong, young man. When Richardson is approached with a business idea, he is at first repulsed but then, short of cash, acquiesces; he will put Wash to stud on the neighboring plantations. Just as with the horses, an appointment book, a stud book, is kept, the records as exact as can be. Over time, for great distances, in every direction, Wash’s children are born and thrive. All over the county one encounters Wash’s eyebrow, or chin, or cheekbone. The midwife who delivers them is the slave Pallas, who was herself cruelly used sexually on a neighboring plantation. She and Wash are both deeply wounded people, isolated from all others, held in contempt or fear. Both have learned the art of psychic self-preservation, how to go deep inside themselves, remembering their own childhood stories and the family stories told them by their mothers to create a private, spiritual safe “inside place,” where no one else can follow. Over years we see these two slowly come to trust one another and we watch Richardson struggle with enormous difficulties in creating the new country and in coming to terms with his own demons. This is the best new Southern novel I have read in quite a while.